Cannellini bean = white kidney bean = fazolia bean. You’ve probably already encountered this Italian bean in minestrone soup or a bean salad. It’s prized for its smooth and creamy texture and nutty flavor. If you were brought up Italian, the cannellini bean was an every day staple. This soup is simple, fast, and very delicious. My husband, Wayne, and I prepare it at least once a week after work because of its simplicity. I was given the recipe by a friend several years ago who told me that the original version is from the famous Italian cookbook writer Marcella Hazan. It truly tastes like you spent a lot more time on it than you will. I am much more generous with the garlic and fresh parsley than the original recipe. My friend, Debra, uses fresh marjoram in lieu of parsley and proclaims it to be yummy. I, myself, have only made it with parsley. Of course, you have to love garlic to love the soup! Wayne and I ate the most delicious rainbow chard yesterday. It is a vegetable to feast your eyes on and so nutritious as well. It features red, white, and gold stems and large, rippled glossy leaves. All the colors make this vegetable look very magical. This particular chard came all the way from a California grower called Lakeside Organic Gardens. Of course, I would buy it locally, if Orlando could grow chard. Florida oranges and avocadoes are more our speed. Here I am at our kitchen sink painstakingly rinsing out all the sand and lots of sand there was! I remember my Mom washing all the sand and debris out of escarole. I could hear her voice giving directives and see her hands repeatedly dipping in and out of the cold water. She taught me to fill up a large bowl or pot and dunk and soak the greens. Then she would say to let the leaves kind of float to the top of the water and gently remove all the leaves and place them in another container. All the sand would sink to the bottom of the pot. Then she would dump out the water and repeat the procedure until the water was free of sand. It was a lot of work, but well worth it in the end. I sauteed our lovely chard with garlic, olive oil, touch of salt, and a pinch of red pepper flakes. Yummy! “Molto bene” for rainbow chard! Wayne just loves this frittata because it encompasses the best of both of his favorite foods, that is, eggs and pasta. I have substituted gluten free linguine (Quinoa gluten free works well) for the usual potatoes in the recipe. It is fun food and delicious too. It actually tastes better the next day at room temperature. The frittata is a good lunch box or picnic food. A fresh tomato salad is the perfect accompaniment. Enjoy! Beat eggs in bowl. Add parmesan cheese, basil, salt and pepper. Set aside. In a 10 inch skillet, saute red onion in olive oil for several minutes until translucent. 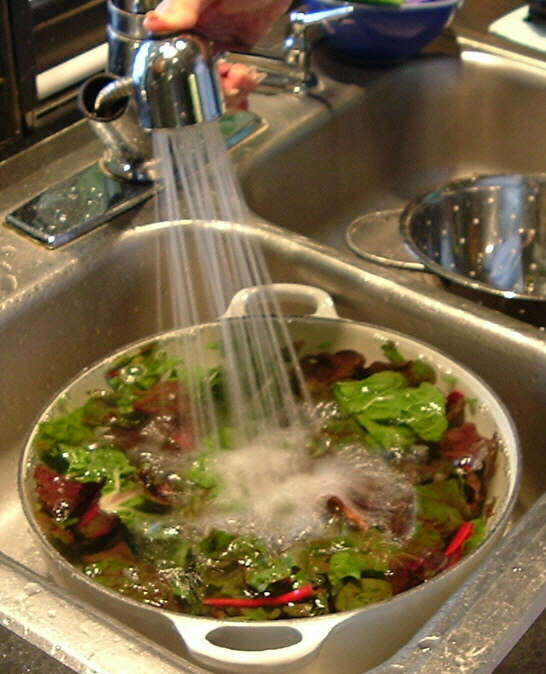 Stir in spinach leaves until wilted. Place mozzarella cubes and linguine on top of spinach and onion mixture in skillet. Pour egg mixture over all. Turn heat down low, cover, and cook until just set. It sets rather quickly, so keep an eye on it and don’t overcook. When just set and still a litte moist on top, brown quickly under the broiler for about a minute. Makes about 4 servings. My sister, Grace, loves cooking gadgets. She owns the most impressive collection of kitchen gadgets on the East coast. I also admire the fact that she is so knowledgeable about how they work and uses every single one of them all the time. None of them collect dust. She lives in New England and I live in Florida, and we usually share a wonderful chat together on our cell phones as we both drive home from work on Thursday afternoons. Yesterday, she excitedly told me all about the newest gadget in her life, that is, the Cuisinart Mini Prep Food Processor. She said she had a copious crop of basil growing in her garden and made a batch of pesto using the new processor. She said it came out just delicious and the performance of the mini prep was more than she expected. Grace said she loved the color too, black chrome with a black wire. White appliance wires can look so dingy after awhile. I hung up with her and could not stop thinking about pesto! Just the day before my sister’s call, I chatted with my dear and wonderful friend, Agi. She moved into her new home and planted purple basil. It is quite beautiful and has suprisingly it has given her a prolific crop. She asked me for my pesto recipe. It seems like everyone has pesto on their mind this week. Both Grace and Agi have inspired me to share with you my pesto recipe that I have made for over thirty years. Pesto originated in Genoa and the classic way to prepare it is with a mortar and pestle. Pesto literally means “pounded.” But of course, we are all to busy these days for such nonsense, so grab your blender or processor (or you may want to check out the new Cuisinart Mini Prep), and whirl up some delicious pesto to share with family and friends. Combine basil, garlic, salt and pepper in work bowl of processor and blend to fine paste, scraping down sides of bowl as necessary. Add pine nuts and cheese and process until smooth. With machine running, pour olive oil through feed tube in slow steady stream and mix until almost smooth. If it is too thick, you can add a little bit more olive oil. If you choose to use a blender, put all ingredients into blender except olive oil and pulse chop until it almost paste, then with machine running pour olive oil into mixture through opening in blender top. 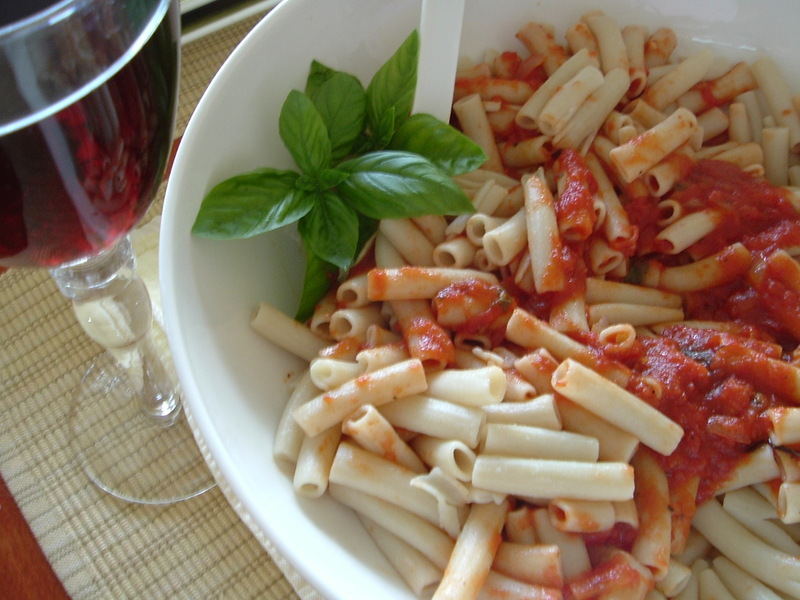 Boil your favorite pasta and reserve about a cup of cooking water. 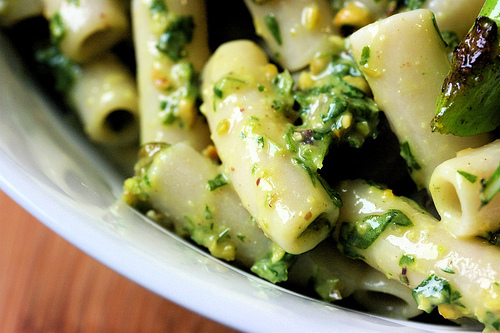 Mix your pasta with a lump of butter before adding the pesto. Loosen up the pasta and pesto with some reserved pasta water. 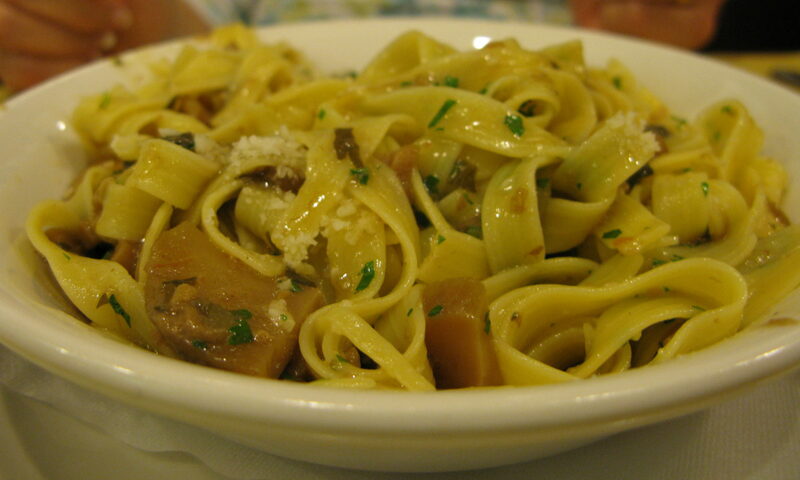 We like this on Tinkyada fettucini with some freshly diced plum tomatoes sprinkled on top. Enjoy! Pesto tip: When storing pesto in the refrigerator or freezer, add a film of olive oil about 1/8 inch thick to the top to prevent sauce from drying out. Mix it in when ready to use. Always bring chilled pesto to room temperature before serving. Afterthought: When I used to lived up North, I remember hanging on to the skirts of summer’s fresh bounty. My back yard and every friend’s backyard as well as every farm stand would boast the huge bouquets of fragrant sweet basil. It is surely one of nature’s most precious gifts, and pesto is undoubtably one of the best ways to enjoy its goodness.